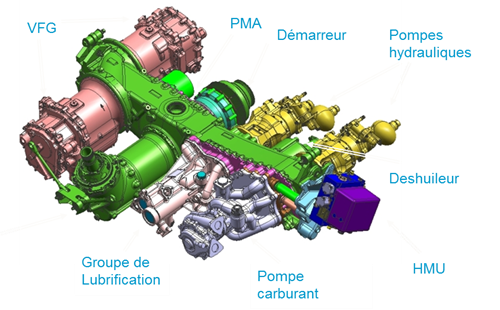 On December 4, 2014, the Safran Group, INSA de Lyon, and ECAM Lyon joined together to create the research and academic chair Innovative Mechanical Transmissions for Aeronautics (IMTA). For over 15 years, INSA Lyon’s LaMCoS, ECAM Lyon’s LabECAM, and the SAFRAN Transmission Systems group’s have collaborated to be a top-leader in the field of power transmission. Due to rising fuel costs and growing environmental concerns, the aeronautical industry has focused its R&D on improving aircraft engine efficiency. Current projects aim to reduce fuel consumption as well as optimizing part cost and reliability. Accessory drive gearboxes make up one of the major factors in overall system performance. That is why current research is studying methods to optimize their design and integration within the engine. Through these studies, significant increases within the transmission chain are possible, as well as within the propulsion system by modifying the products overall architecture. The IMTA Chair is firmly established in the field of sustainable development in the air transportation sector. The purpose of this chair is to privilege and consolidate development in new research topics in the field of mechanical transmission for the aeronautical industry. The chair carries out applied upstream research and bridges the gap between the various approaches by centralizing skills and knowledge from LaMCos (INSA Lyon), LabECAM (ECAM Lyon), and Hispano-Suiza (SAFRAN group). The CIRTrans consortium has taken shape over the years thanks to the knowledge network that has been built around a gear specialization. Its mission is to develop long-lasting expertise by bringing together people and resources around one common goal: power transmission. The consortium allows business partners to develop together by pooling resources while still benefitting from the research potential of the associate schools and laboratories. Companies are also able to develop their skills and knowledge through research projects, or even come together on shared methods and tools. The project that started 2 years ago, allows teams to reimagine the necessary developments to create tomorrow’s transmissions. The first project include 2 research dissertations that cover epicyclic gearing thermodynamics and sound reduction. At the same time, a project to standardize calculating and method development tools is being studied.